We are unique animals because we use language for complicated social communication and conceptual problem solving. Although human children appear to acquire easily language within a few years of birth, a computer cannot learn a human language like human children, even if we use very advanced technology represented by current computer science. Our aim is to clarify how children acquire language and to apply scientific evidence to support parenting and early education with ICT technology. At 12 months, children begin to learn words by extracting specific sound patterns from ongoing speech and associating them with referents. At 18-20 months, they learn words in an efficient and rapid way and utter sentences by connecting multiple words. After 24 months, children increase their syntactic knowledge and acquire refined language-based communication. To clarify the language acquisition mechanism, we employ an interdisciplinary approach that combines experimental psychology, psycholinguistics, natural language processing, and cognitive science. 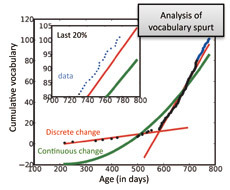 By analyzing large samples of longitudinal data on early vocabulary growth collected by Japanese web users, we clarified some characteristics of the first 50 words in Japanese (a composition of semantic category and baby-talk words) and the mechanisms of vocabulary spurts (a rapid change in word learning rate). Based on these findings, we are developing a statistical methodology for classifying individual differences on developmental pathways and applying the evidence to a new business that supports parenting and early education based on the developmental status of each child. Using an experimental psychology-based approach, we are investigating how and when 1-year-old children associate specific sound patterns with referents to efficiently increase their vocabulary. 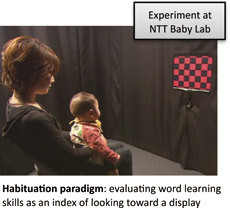 We provide new evidence that Japanese-speaking children begin to form word-object and word-action associations at 12-14 months and use morphosyntactic cues for noun and verb learning at 20 months. We are now investigating cross-linguistically whether French- and English-speaking children develop their lexical and syntactic ability in a similar way. Linguistic inputs from parents have an indispensable impact on language acquisition. In academic and applied research, we clarify what kinds of inputs Japanese experience and how they contribute to lexical/syntactic learning. 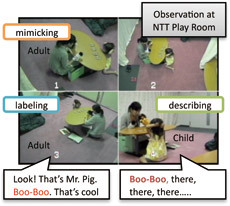 By collecting and analyzing observational data on mother-child interactions, we are currently examining the role of baby-talk words and specifying frequent sentence frames and common dialogue structures. 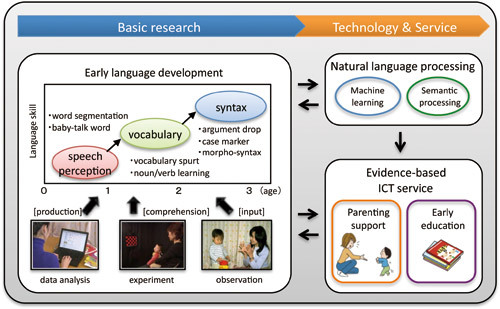 As a next step, we will clarify the characteristics of inputs in Japanese and apply the empirical findings to the technology needed for an automatic dialogue system for children.